History, culture, gastronomy and folklore, nature and cities of art in an extremely high rate tourist trail and spectacular. They are all the ingredients of good living that Umbria has to offer with its beauty and its treasures. The Casa dei Figli e delle Ancelle of the Amore Misericordioso, the first part of a large structure, was built at the beginning of the 1950s in front of the Collevalenza Castle on land called the Roccolo, by Mother Speranza. Maria Josepha Alhama Palma was born in Santomera, Spain on 30 September 1893 and became a nun in 1951, taking the name Speranza. She arrived in Collevalenza following many years of service, first in Spain and later in Italy, where she continued serving until her death on 8 February 1983, worshiped as a saint. The religious compound reached its first true urban definition with the Temple, begun in 1963 and finished in 1967, following the project by the Spanish architect Julio Lafuente. In the area of the Sanctuary there are five baths to immerse patients and the faithful, the “Home for Pilgrams” and the “Home for elderly priests”. The Castle maintained its role as the single urban element in the Collevalenza territory for the first half of the eighteenth century, just like other nearby castles such as Rosceto, Chioano and Torrececcona, while the remaining structures were mostly single houses or small groups of homes. For most of the century the medieval walls were intact, with the four easily identified towers, even though they were tampered with during this period, cut or transformed. 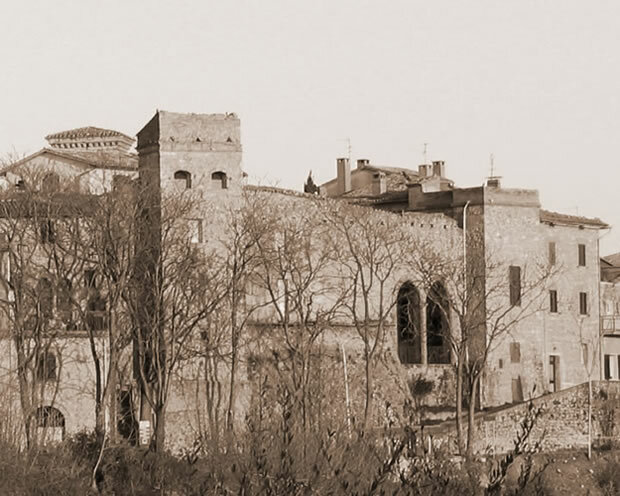 Until the beginning of the ‘900 the Castle had a main entrance, though the arch above which is the eagle of Todi and a passage called “the Hole”, opened in ‘800. In the first years of the century, a second entrance was opened taking down a piece of the southern wall and the wooden door was taken to Todi. The large windows with curved arches to give light to the piazza were opened just after World War I. The round stone on the wall, called the “muraglione”, before the arch, weighs about 150 kilograms and was walled up during the time of fascism as the base for the Italian flag. Before that it lie on the ground and was often made to roll around as a game. Originally it was used as the base for a wooden cross. Another similar stone existed, which was lost, it is believed that both marked the border of the parish. The letters inscribed on the side attribute a religious use: HOC.SIGNUM OSCULANS. LUCRA LX. DIERU.IND (Kissing the inscription gives 40 days indulgence). The church parish, dedicated to Giovanni Battista, was built in 1925 and preserves a baptistery of great value dating 1466. Its antique origins are tied to the proximity of an important exchange and mail station on the Via Flaminia. It conserves almost all of the original medieval wall, the main door and remains of numerous towers, which are next to an elegant tower in the Municipal Palace. The serious damage caused by a recent earthquake has made important restoration works necessary in the whole ancient structure. Orvieto is an ancient town full of charm and history, rich in events and significant monuments (such as the Duomo and the Well of Saint Patrick). 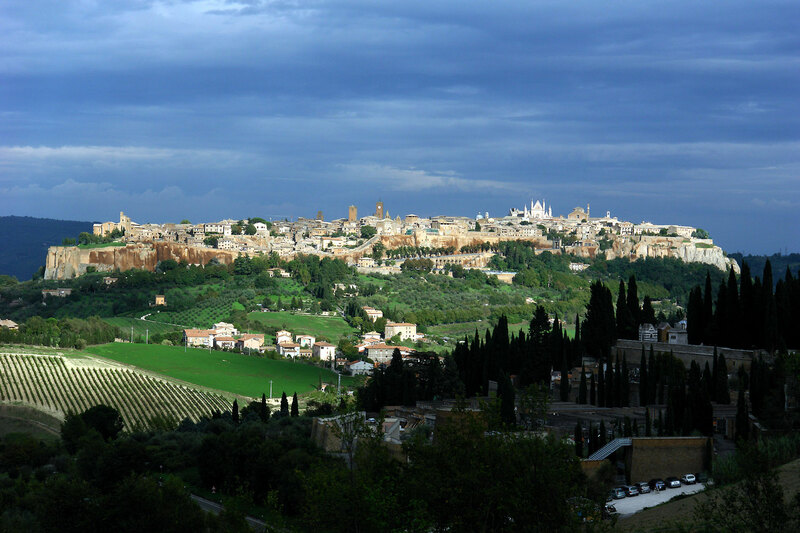 The origins of Orvieto date back to Etruscan civilization: the first settlements, are from the 9th century BC and they were located within the tufa caves found in the massif on which the city is now standing. 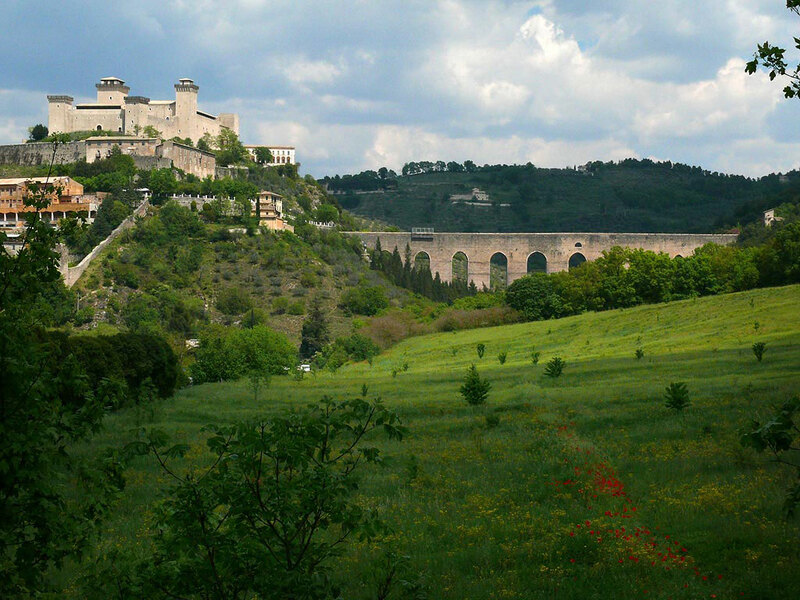 The beauties to be seen in Spoleto are numerous among these are the Albornoz fortress symbol of the city, the bridge of the Towers, the Duomo, the Roman theater, the church of St. Peter. 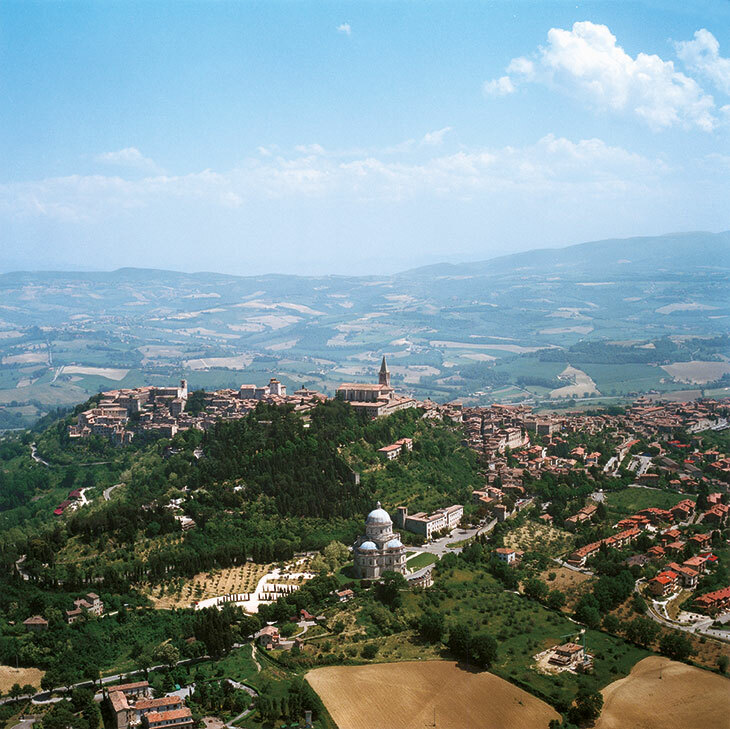 Poleto is also famous because in June and July it hosts a festival of the two worlds that devotes a vast space to art in its many forms: theater performances concerts, operas, ballets, exhibitions and recalls artists coming from various parts of the world. 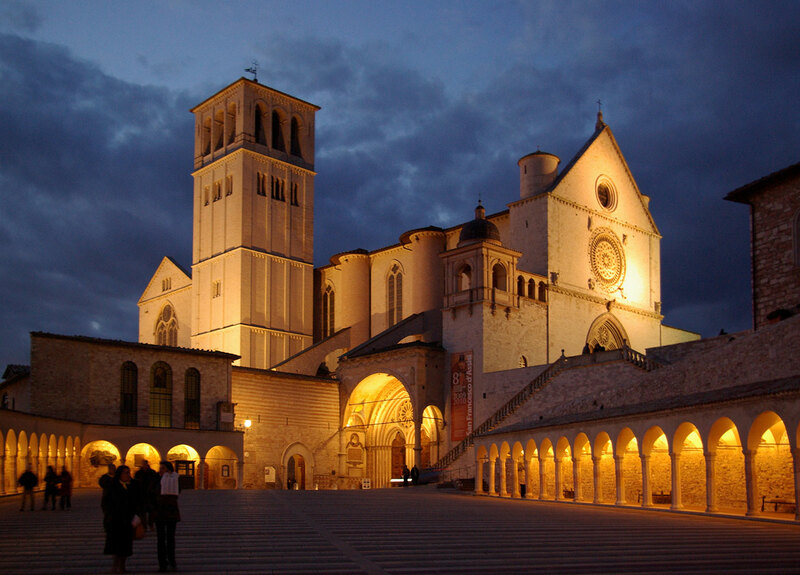 It is known for being the city in which they were born, lived and died, Saint Francis, patron of Italy, and Saint Clare, as well as for his artistic wonders such as the Basilica of Saint Francis of Assisi. The Marmore Falls are one of the most famous waterfalls in Italy. 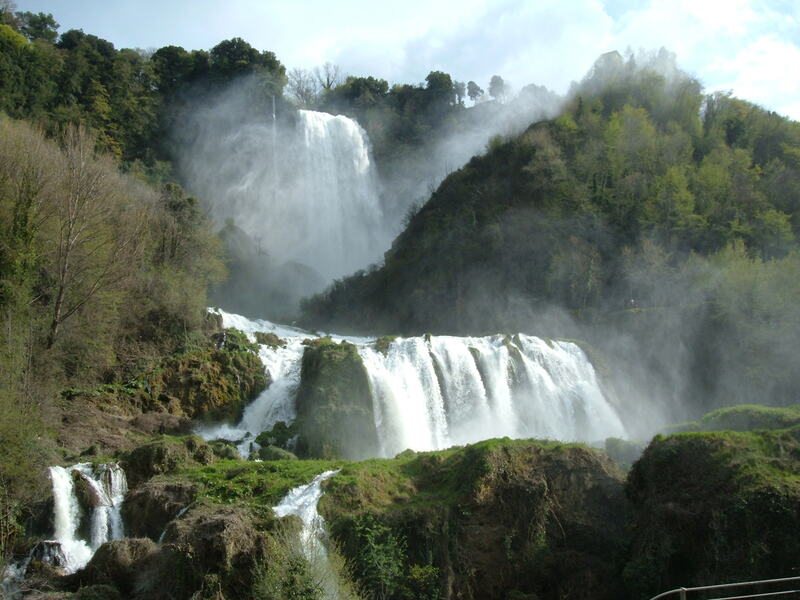 It is located in Valnerina, a short distance from the city of Terni, in the wonderful Marmore Waterfall Natural Park. If you go near Terni, the Waterfall is one of the places to visit: its beauty has fascinated over the centuries by poets and writers, and continues to fascinate every year thousands of tourists who decide to visit it.